Comfort is important when riding you bike. Whether a quick ride around your neighborhood or an Ironman competition, you need to be comfortable and relaxed. The correct position keeps your body aligned on the bike, helping to prevent injuries. Your body will thank us! An ideal position will maximize power, speed, and endurance. We have more fitting experience than any other shop in the area with over 10,000 fittings. We spend over 3 hours fitting you. Our video describes our fitting philosophy and what we do to ensure a proper fit. 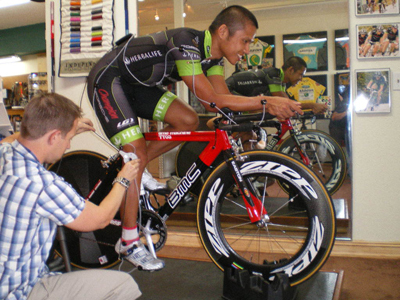 We pair the most respected certifications with real-world experience to provide you with the best possible bike fit. Whether you are a seasoned veteran cyclist or just getting started, a fit from The Racer's Edge will enhance your investment in the sport. We can assess your existing bicycle and dial in the right fit to maximize your performance, and when you’re ready to buy a new bike, we will analyze your riding style and provide you with the best bike setup and fit possible. Retül allows our expert fitters to measure and track a riders' position and movements in 3D, in real time, to the millimeter. This instant feed back and laboratory precision gives our fitters the ability to apply their expertise and experience at a level otherwise impossible. Using 8 LED markers strategically placed on the wrist, elbow, shoulder, hip, knee, ankle and ball of the foot, the Retül sensor gathers information in real time and transmits it to the PC. A Serotta Personal Fit is just that -- personal. We don't just ask you to fill out a questionnaire or take standard measurements. We plan to invest an hour or more of our time learning all we can about you as a cyclist before we even think about designing your perfectly fit bicycle. We conduct an interview to learn about your riding style, your experiences, and your goals. Your flexibility and core strength are assessed to determine your range of motion and ability to comfortably hold a position. We find the position where your pedal stroke is most effective and your body relaxed by observing your good and bad postural habits, your pedal stroke, and see how relaxed you are. 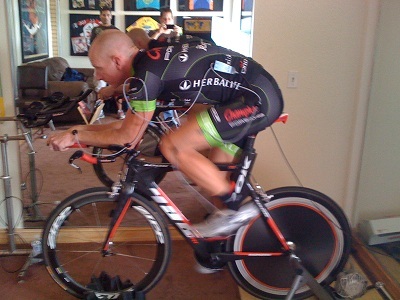 Your fit is finely adjusted until we find the position where power, endurance, comfort and aerodynamics are optimized. 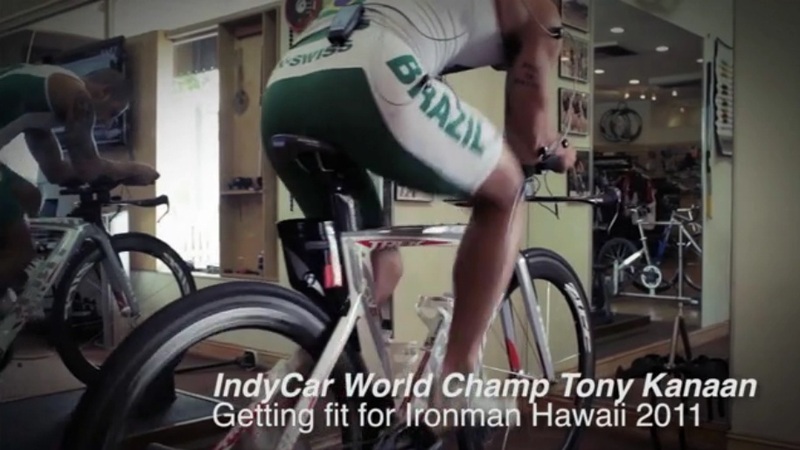 A triathlon bike is designed with one purpose in mind: Efficiency. In this 90 minute session, a F.I.S.T Certified Technician will discuss your history, goals, areas of concerns, and desired outcomes. Your bio mechanics, flexibility, core strength, and range of motion are then assessed. Your position will be optimized according to F.I.S.T protocol.